If you’ve been watching the clock since Bryan first brought up the idea of agile hardware with me back during SNUG 2009, you’ll know that we’ve been working on AgileSoC.com for exactly 1710 days. That’s March 15th, 2009 to today. To commemorate the 1710 day anniversary of AgileSoC.com, I figured something special was in order. Specifically, something special to recognize the people that have helped fuel this little experiment; those who have helped turn very little into a little more. We’ve had people contribute guest blogs talking about their experience with agile. We’ve had a guy argue against agile development in a guest blog (every movement needs it’s skeptics, hey Mike?). We’ve had people blogging on their own about agile hardware development and people post my articles on other higher profile sites. Some have been brave enough to present their own material at conferences (which is something we need more of). I’ve had real agile experts offer one-on-one time with me to explain some of what’s done in software. We have people experimenting with SVUnit and MiniTB and sharing their experiences. We even have SVUnit being integrated into other tools. There’s the enablers that make contributions by the rest of us possible. Then there’s the people that are just down right encouraging to the point they’ve become true agile hardware advocates; spreading the word within their own circles. In short, a lot of different people have helped this thing along in a lot of different ways. All helpful and very much appreciated. To thank all of you that have helped out – there are 50 of you that I could think of – I got you a small gift. I’m not much of a graphic designer, but for me it’s the message that counts. 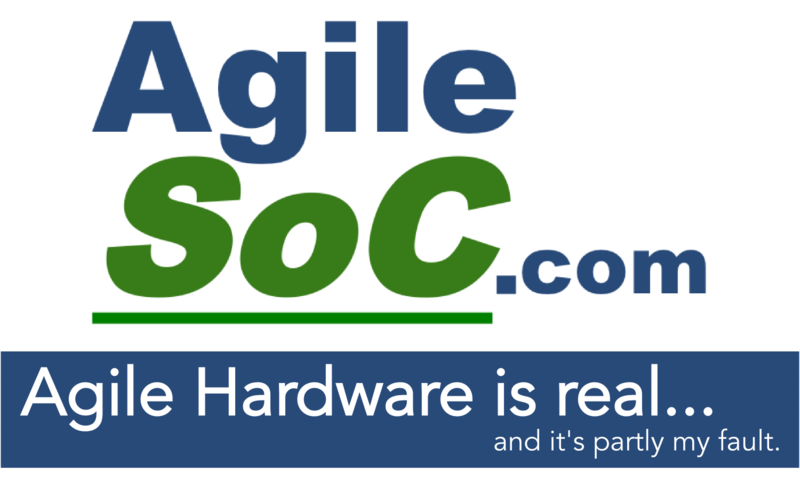 Agile hardware is real… and it’s partly [your] fault. I want everyone to feel like they can take credit for the effort they’ve put in to building the agile hardware community. Even the people who’ll open their envelope and wonder what the hell they’ve done to earn it! You’ve earned it, believe me. 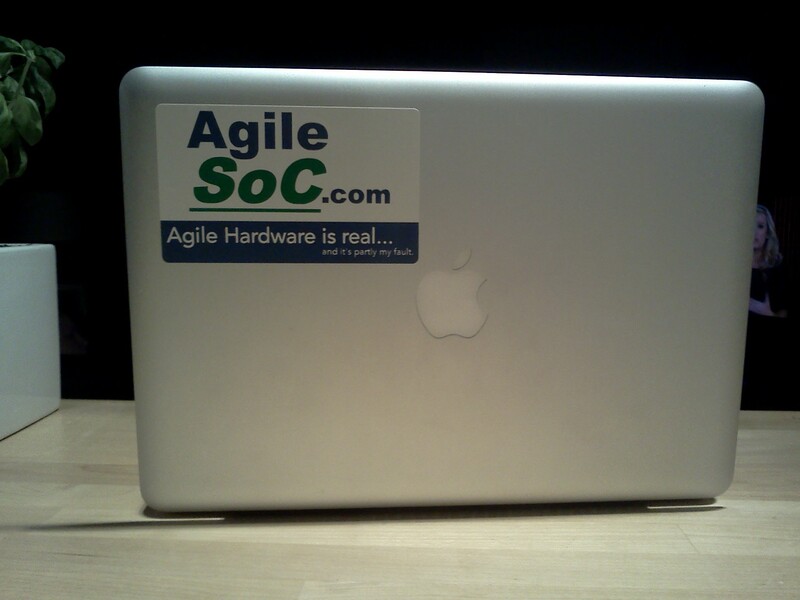 The AgileSoC stickers being modeled by my laptop were sent out friday morning. They’re going worldwide so depending on how close you are to Calgary, you can expect one in your mailbox by the end of this week or shortly thereafter. Please wear them proudly (I had mine stuck to my laptop the second they arrived). To give people an idea of where you’ll be able to see these stickers on display, we’ll have people taking credit for agile hardware in Toronto, Ottawa, Vancouver, Montreal, California, Illinois, Michigan, Massachusetts, North Carolina, Oregon, Arizona, Texas, Utah, Germany, Finland, England, India and Denmark. …but they’re out there, somewhere, and they will be great. I’m quite sure of that. Lastly, these stickers cost me $0.75 each. Larger volumes mean a discount next time around so the more people I have to thank in 1710 days from today, the better :).